Coming into Toyota Center, the Phoenix Suns had lost their last two games by 18 and 16 points without Steve Nash. What happened in Houston with Nash? They spanked the Rockets 123-116. Struggling teams should play Houston for all that ails them. It’s just Houston’s luck that Nash overcame his ‘doubtful’ status for the game to lead his team to a victory with 24 points and 9 assists. The Rockets needed a break and play against a team with their superstars out, like Houston with Yao Ming & Aaron Brooks. Yao Ming and Aaron Brooks returned to Toyota Center in street clothes. Their moral support from the bench still wasn’t enough to overcome the Suns, though. The Suns’ starting center, Robin Lopez, was out with a sprained left knee, so Houston was equal on the “center-being-out” front. If Nash had stayed out, they probably would have won. That’s what we’ve come to: hoping opposing teams’ superstars don’t play. Things are looking really bad for Houston when you compare them to other bad teams around the league. Last night the 1-13 Clippers beat the 11-1 New Orleans’ Hornets in a very close game. Even the CLIPPERS can find a way to beat really good teams, and they did it after making multiple mistakes in the game’s final two minutes (two blown layups, a turnover resulting in a fast break basket for New Orleans). But they still overcame. Houston can’t. And did you see Sunday night how Rudy Gay hit a huge bucket as time expired over LeBron James to give the Grizzlies’ a win over Miami? Wow, that kind of player who can create his own shot would really be useful right now (sorry Shane). Looking at Gays’ stats this season, it makes Rocket fans wonder what could have been, although his $13.6 million salary compared to Battier’s $7 million is something I don’t think Houston, nor any team, would have paid. The Rockets game up 123 points on 54% shooting is atrocious and you’re not going to win many games with those kinds of stats. And Houston fouled Phoenix twice as many times (26 to 14) and was outshot on the free throw line 32-12! Houston also went 0-for-12 on 3-pointers in the first half, which killed them. Hitting 6-of-14 treys in the second half to finish 23% from 3-point land still wasn’t good enough, especially given that Phoenix hit 7-of-13 for 54%. – The Rockets killed the Suns on the boards, 51-33. That gave them 7 more field goals (49) than Phoenix, and Houston had 31 assists leading to those 49 field goals. They also dominated Phoenix in the paint (62 points to 42). – The bench responded after being told by Coach Rick Adelman they need to step up, outscoring the Suns 50-28. Jordan Hill had a season-high 14 points on 7-of-8 shooting and 10 rebounds, and Courtney Lee scored 16 points on 7-of-14 shots. Chase Budinger finally hit some shots after going 0-for-6 in Toronto, hitting 3-of-8 shots, although he missed all 4 of his 3-pointers. That’s something Jeff Van Gundy didn’t do much of, and I think it eventually cost him his job not cultivating his younger players. So at least there some progress on giving the young guns a chance. The only problem is that Adelman didn’t play Jermaine Taylor at all Monday night. That needs to happen, even if it comes at the expense of less minutes for Budinger. The Rockets needed to win in Phoenix Wednesday night to prove they could take the division lead away from the Spurs, not just by hoping San Antonio would continue losing games against teams they should beat, like Oklahoma City Tuesday night. Yao Ming was calm and measured shooting over Shaq Wednesday night. If the Rockets were going to get the 2nd or 3rd seed in the West — which would be a golden opportunity to get more favorable match-ups (no Jazz) — they would have to show they have the mental strength to beat a 9th-seeded team when the chips are down, especially after the Rockets just went 3 days where they didn’t have to play, and had only played one game 1 game in 7 days. After all, they don’t have much more time to get it going before the playoffs start on April 18th. I’ll cut to the chase: they failed the test. Not as badly as they did in Utah last week, but a loss is still a loss. I’m pissed that they came out with no intensity. The Suns looked like they were going to run away with it when they hit 9 of their first 10 shots, shot 80% in the first quarter, 61% in the first half, outrebounded the Rockets 26-11, outscored them 32-16 in the paint, and led 67-56 at halftime. To their credit, the Rockets finally got serious, made a run in the third quarter thanks in part to Yao scoring 6 straight points, and entered the 4th quarter tied at 88-88. At that time, I thought the Rockets were going to need to build a big lead in the 4th to just hold on for dear life, because we knew it was going to be a crazy 4th quarter with Nash and Shaq fighting for their playoff hopes. Well, the Rockets did that according to plan, opening up an 86-79 lead. That’s when you step on your opponent’s throat and put them away, right? Instead, they fell apart, missing 9 shots in a row and turning the ball over 3 times while letting the Suns go on a 15-0 run to take a 7-point lead with 4:17 remaining. The damage had been done, much to my worries. The Rockets made a mini-run to try to get back into it, but they were going to have to rely on a colossal breakdown by the Suns to win it. That’s not going to happen with Steve Nash at the helm. Rockets lose 114-109. This loss hurts not only because the Rockets had the Suns on the ropes, but because it brings up the concern again that they can’t win big games against decent teams on the road in a statement game like this one where they could grab the playoff position they want by the neck. Remember the Utah Jazz game in Salt Lake they couldn’t win last week? The Rockets got away from the things during that dry spell in the 4th quarter that they had done so well in the 3rd. Just like ESPN’s Jon Barry said in the fourth: you just don’t know what their offense is going to do, and too often they get away from Yao. Except for a few series, like when Yao let Steve Nash drive right past him under the bucket for a layup without even contesting the shot, and getting blocked twice in a row (at the beginning of the fourth quarter), I liked how Yao didn’t try too hard to make things happen that he’s not capable of doing, like dribbling too much before a shot. Instead, he just shot jump hooks over Shaq and turnaround jumpers. It worked to a degree: Yao would finish with 20 points on 9-of-18 shots and 14 boards. But there was one big error that Yao made late in the game that was costly. With the Rockets down 111-105 with 1:32 remaining, Yao grabbed a defensive rebound and the Rockets really needed a score in a bad way. Good. But he wasn’t careful enough to watch where he threw his outlet pass. He intended to throw it to Aaron Brooks who was further up the court, but Yao telegraphed the path such that it was an easy steal for Nash, and that was the ball game right there. You just can’t make silly mistakes like that at that juncture of the game. I’ve been a big supporter of Aaron Brooks in the past because his points are very much needed by the Rockets. Although he only scored 9 points Wednesday night, he did have 5 assists. But I was pretty upset in the 3rd quarter when he had a terrible series of 3 plays in a row when he got stripped by Shaq (or tried to throw a behind-the-back bounce pass, I couldn’t tell), then took an ill-advised 3-pointer when he should have dumped it into Yao, then threw a bad bounce pass into Yao in the post that Shaq knocked away for a steal. This series shows Aaron still has some maturing to do. But like I’ve mentioned before: don’t blame Brooks for being a young player. It was the Rockets front office who rolled the dice by trading away Rafer Alston and promoting Brooks to be the starter. I have full confidence that the move will turn out to be the right one over the next few years, but the question is will it pay off in time for this year’s playoffs? Time will tell. It may be more acceptable to lose a game like this one EARLY in the season when you have dozens of games to make up for it, but now it’s time to get serious and show you can put teams away. THIS game was as close as to a playoff game as you can get, and if you can’t put the 9th-seeded team away only 8 games away from the playoffs, and that team misses 15 free throws, including 3 from Nash (who had only missed 10 all year!) then chances are you’re not going to be able to do it consistently a couple of weeks from now when the playoffs start. Get prepared, Houston. Based on what I saw Wednesday, this could be another “one and done” playoff season for the Rockets. If that happens, look for some major changes to be made in the off-season for the Rockets get mentally tougher. On the bright side, Shane Battier‘s point production has been coming around lately. He scored 18 points thanks to 4-of-7 shooting from 3-point land. Von Wafer had an outstanding game with 17 points on 8-of-10 shots, taking it strong to the hole on numerous occasions. But it wasn’t enough to overcome an extreme rarity these days: Luis Scola only hit 2-of-5 shots for 4 points. The fourth quarter of Rockets-Suns game was one of the most exciting fourth quarters of regular season basketball I have seen in a long time, all which culminated in a 116-112 thrilling victory for Houston. The offensive fireworks were jaw dropping as both teams traded baskets like Ali-Frazier trading blows in the ring. The defense wasn’t all that bad; it was just two very talented offensive teams playing at an extremely high level. If you missed it, try to find a friend who recorded it. Yao Ming shoots a sky hook over Shaq Friday night in a game where the little guys stole the show. Click here for more photos from the game. * Yao Ming delivered 3 assists in the post to Kyle Lowry (no-look flip pass over Shaq), Aaron Brooks (bounce pass), and Carl Landry for layups. * Ron Artest hit two late-game shots that Tracy McGrady never could seem to deliver reliably. There was a time just a few weeks ago when the Rockets’ roster that included Rafer Alston and McGrady wouldn’t have been able to amp up the offense like this to key 9 games out of their past 11, and 11 wins in a row at home. You have to be really happy for Brooks who must have been feeling a little bit of pressure after not being all that effective in his last game in Utah, and Lowry’s performance to get the Rockets back in that game to overshadow him. AB hasn’t been the most consistent player this season, but when he’s on, he’s on. His record speaks for itself: as a starter this season, Aaron is now 13-3. Brooks would score a career-high 30 points Friday night off 11-of-20 shots (4-of-7 from downtown), including 9 in the fourth quarter which included a 3-pointer, a runner in the lane, and an amazing scoop shot off the glass underneath Shaq’s outstretched arms. All these scores occurred when the Rockets needed buckets since Phoenix wouldn’t quit — they just kept coming at ’em. Steve Nash was incredible by scoring 29 of his 32 points in the second half, but Aaron matched him better than any point guard I’ve seen in a Rockets uniform in a long time. This is a mind-blowing development for Rocket fans! If Brooks can keep this up and have games that remind you of a Chris Paul or Tony Parker, then watch out NBA – this Rockets team is going to be extremely hard to beat for years to come given all the young talent they have on their roster. The compliments don’t get much better than that. Nash had a chance to win the game with a 3-pointer with just a couple of seconds left in the game, but Yao came out to the 3-point line to contest the shot, which was enough to force him to shoot the ball with a higher arc than normal…just enough to make the shot miss for the Rockets’ win. When that play developed, I was wondering who agent Bill Duffy was rooting for since he represents both Yao and Nash. 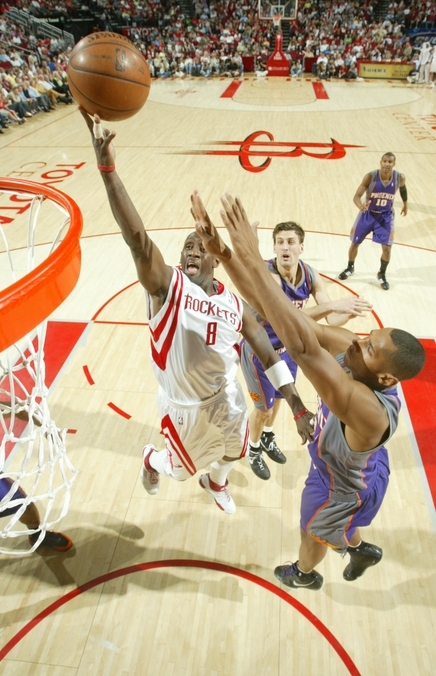 Bobby Jackson takes it strong to the hole against the Phoenix Suns, helping the Rockets beat the Suns 101-90 in a game where Jackson scored 13 points on 6-of-10 shooting off the bench. Houston’s bench was outstanding, scoring 43 points on 19-of-28 shooting. If you had stopped watching the Rockets since Yao got hurt, or after their 22-game winning streak ended, then you probably missed one of their best games of the season Friday night. I had written the other day that heading into the final 4 games of the season, I was hoping to be pleasantly surprised if the Rockets could get some quality wins against good teams like Phoenix, Utah and Denver. Opening up a double-digit lead in the second quarter after falling behind 13-2, I can’t believe how badly they beat the big bad Suns with Shaq, Nash, Amare, Barbosa, and everyone else they have. With a dominating 101-90 win in a game that meant alot to both teams for playoff seeding purposes, just like that, the Rockets have won five games in a row and are only 1 game behind New Orleans for first place in the West. I thought this was going to be another game in which the Suns run the Rockets ragged. But Houston stayed tough and didn’t get down on themselves when they were getting killed to start the game. They not only got their offense turned around by going on a 14-3 run to tie the game at 16-16 and take over from there, but they also turned up their defense with their best defensive player — Shane Battier — sidelined with a sore foot. On top of that, they were able to overcome a poor shooting night from his replacement in the starting lineup, Luther Head, who only scored 4 points (2-of-8 shooting) and starting point guard Rafer Alston only scoring 5 points on 2-of-11 shooting. How in the world were they able to overcome numbers like that, as well as the loss of Battier? Phoenix’s Amare Stoudemire was too much to handle for the Rockets as he scored 38 points, grabbed 13 boards, made 20-of-20 free throws, and blocked 4 shots on the way to beating Houston 122-113. This game continues to illustrate how much the Rockets are missing Yao Ming’s presence in the middle. I did something I rarely do watching a Rockets game. They were stinking it up so bad in the first half in Phoenix Saturday night, I changed the channel. I couldn’t take the massacre I was watching. As they fell behind by 17 points in the first quarter, they didn’t deserve any Rocket fan’s attention. Things got worse as they fell behind by 23 points in the second quarter. So instead, I watched a much better game between UCLA and Texas A&M, a hell of a game which the Bruins pulled out in the final minutes. That was the best decision I made all day. For good measure, I decided to record the Rockets game just in case some fluke happened and they made a game of it. To my surprise, when I watched the recording I saw the Rockets end up closing the deficit to 8 or 9 points a couple of times in the second half. But the whole time I thought Phoenix was just toying with them. Anytime the Rockets got close, the Suns would turn it on and make the Rockets look like pretenders. When I had earlier changed the channel away from the game, it was halftime and the Suns had shot an incredible 76% from the field, had 18 assists, and scored 30 points in the paint to lead 74-57. You’ve got to be kidding me — 74 points by halftime? Yao Ming shoots a huge jump hook over the Phoenix Suns’ Amare Stoudemire Wednesday night that gave the Rockets a 96-92 lead with 1:08 remaining in the game. 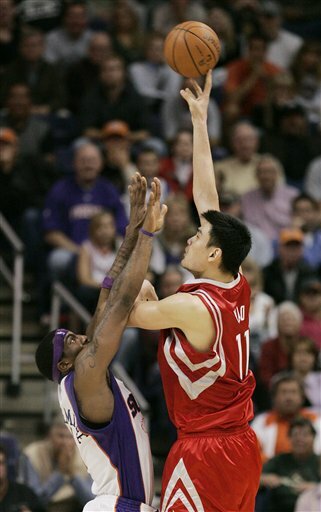 Yao would finish with a monster game, scoring 31 points and grabbing 13 boards in the victory. Click here for more photos from the game. Well, it didn’t take too long for Rocket fans who have been calling for Steve Francis to get quality minutes all season to prove to the head coach they were right all along. Francis got significant minutes on Wednesday night against the Suns in Phoenix, and he was an important reason why they pulled out a big 100-94 win. Francis provided a spark by scoring 9 quality points in 27 minutes. All of his buckets were huge at the time because for every shot he made, you knew it was going to force Adelman to give him more minutes in upcoming games, like most Rocket fans have been saying for weeks now. But those shots he made did another thing – it made Rafer Alston realize that Francis is breathing right down his neck for playing time, and it paid off right away. Alston played much better on offense in this game, but believe me, it’s a fluke because Alston will always be a streak shooter. We’ll get to him more in a minute. Let me finish up on Francis. Yao Ming expresses his frustration to the ref during the Rockets-Suns game on Saturday, November 17th. Yao had a sub-par game against the running Suns, hitting only 4-of-17 shots for 12 points in a 115-105 loss, the Rockets’ fourth loss in a row. Click here for more photos from the game and here for photos that include Steve Francis, Luis Scola, and Tracy McGrady. What an embarrassment. I’m not going to point the blame for the Rockets getting schooled by Phoenix Saturday night on playing five games in 7 days, like the Houston announcers did. I’m also not going to blame it on Tracy McGrady not being in the lineup. Those are cop-outs. (I’m kind of reminding myself of how JVG talks. Scary). Instead, you’ve got to look at the major drop-off in defensive intensity under the Rick Adelman era. All the experts say he focuses on defense just as much as offense. But I have never, ever seen a team shoot 73% in a first half, and 62% overall, like Phoenix did Saturday night, and have as many open 3-pointers (which turned into 6-of-12 from behind the arc in the first half). Sure, the Rockets’ offense looked good in the first quarter scoring 30 points to the Suns’ 37. But you knew they weren’t going to be able to keep up with the Suns, who kept pouring it on in the second and third quarters, hit half their shots in the third, hit three 3-pointers, and outscored the Rockets 25-19 in the third to take an insurmountable 94-76 lead heading into the fourth quarter. The Rockets did cut the deficit down to 9 points in the fourth, but all Phoenix had to do was turn on the jets again by putting Steve Nash back into the game, and that was the ballgame. Even Steve Francis’ first action of the season didn’t make any difference. With Adelman finally figuring out that Rafer Alston had to be replaced in this game starting in the second quarter (a little too late in coming, though), Francis was rusty, hitting only 3-of-11 shot to score 8 points. He did show an ability to penetrate into the lane a couple of times, including dishing a nice bounce pass to Yao for a layup attempt where Yao was fouled. But he also went brain dead a couple of times on defense trying to guard Leandro Barbosa. We’ll see if Adelman keeps playing Francis in lieu of giving Alston so many minutes. I wouldn’t mind it. But to me, the second biggest story of the game right behind the Rockets’ bad defense was Yao Ming’s second bad night in a row. He was only 4-of-17 from the floor, which is about the worst I have seen him shoot when taking that many shots. He was having so many problems, he only played 22 minutes when Adelman decided to take him out and go small with Luis Scola playing center. Yao scrambles on the floor for a loose ball Monday night at Toyota Center against the Phoenix Suns. This play represents how scrappy the Rockets played to pull off an inspirational victory against the Suns to win home court advantage in the first round of the playoffs against the Utah Jazz. Yao finished with 34 points and 9 rebounds, while Tracy McGrady finished with 39 points, 11 rebounds and 9 assists. Click here and here for more photos from the game. Click here and here for pregame photos during the shootaround. Monday night was the kind of game you wait for all season. It was a game that everyone in Houston had marked on their calendar as an “L” against the amazing Phoenix Suns. In a great season that has had many memorable wins (remember beating San Antonio on the road earlier in the season? ), the Rockets played an almost near perfect game to get a win when they really needed it. With home court advantage in the first round of the playoffs at stake, the Rockets shocked the scoreboard watchers in Utah – and around the league – by pulling off a 120-117 victory over the heavily favored Suns. Instead, the Rockets were the ones savoring every last drop of their highly-caffeinated brew of run-and-gun offense, outscoring the highest-scoring team in the league for once. On cue, the Rockets seem to be putting it all together. T-Mac is taking charge. Yao is a monster. The role players are hitting big shots. Remember those games over the past two weeks where the Rockets have blown leads and Van Gundy has been grumpy about poor execution? All of that seems forgotten for now. I went on record saying I wasn’t concerned about those lapses because wins are still wins, and it shows the Rockets might have the stuff to create a lot of damage in the playoffs. I may still be proven wrong, but right now, I think most of Houston is on a high this morning and thinking that way. After losing to Utah at home on April 1st to drop 1.5 games behind the Jazz with only 9 games left in the season, the Rockets have not only risen from the dead to win home court advantage in the first round of the playoffs against Utah, but they did it by beating the juggernaut of a Suns team they hadn’t beaten in 6 attempts. Who would have thought on April Fools Day it would have come down to this? Yao Ming blocks the shot of Phoenix’s Amare Stoudemire Monday night on a night where Yao made only 1-of-9 shots, scored 10 points and grabbed 8 boards. But the officials also ripped him off in the pivotal fourth quarter, thwarting a comeback attempt that led to a big Rockets loss, 102-83. Click here for more photos from the game. This may sound like sour grapes. Sure, the Rockets lost 102-83 against the Suns on Monday night. No surprise. They had lost 5 games in a row to the Suns (now six). The Suns are awesome. It was the second night of a back-to-back for the Rockets. But Yao was robbed by the refs in the fourth quarter when the Rockets still had a chance to come back. The Rockets were down only 78-71 after a Shane Battier 3-pointer with 10:07 remaining. Leandro Barbosa responded with a trey to make it 81-71, and that’s when the bottom started to fall out in the most distressed series of minutes I’ve seen Yao go through. On the following possession, Yao went up for an easy layup, and Kurt Thomas brazenly went up to block his shot with no regard to caring if he was going to be called for a foul. Thomas hit Yao on the wrist, then got ball, and the ref didn’t call a foul. Is that what this game has turned into where you can get away with hard contact if you go up against a much bigger guy? Remember earlier in the season when Nate Robinson “blocked” Yao, drew blood, and no foul was called. Thomas’ “block” wasn’t the first time that Yao was robbed in the game. Earlier in the game, Shawn Marion also got Yao’s wrist on a shot attempt with no foul being called. Luckily after Thomas’ “block,” the ball went out of bounds, and on the very next play, the same exact thing happened! Thomas not only hacked Yao on the wrist on a layup attempt, but he went over his back to do it! Again, the same ref called nothing and let play continue! Yao reacted by throwing his fist in disgust, and for good reason! 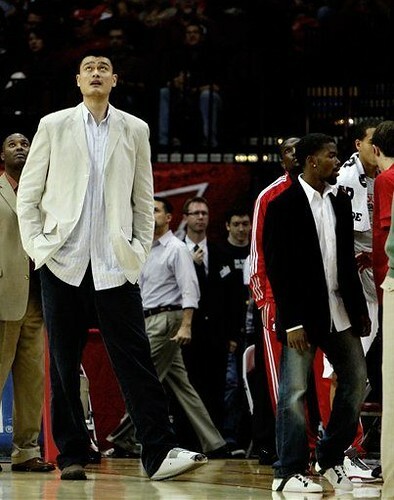 I wish Yao had done more than that to draw a technical to get the refs attention. 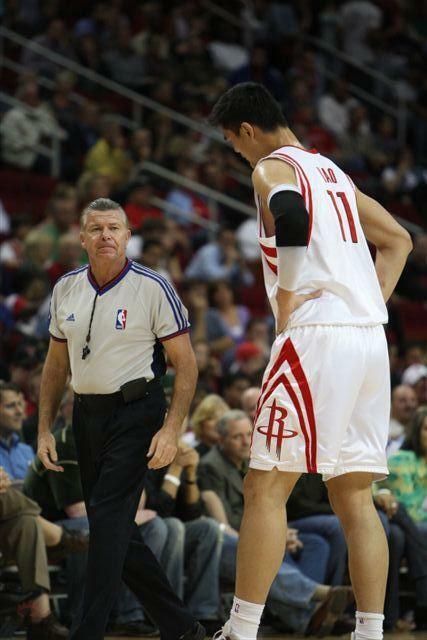 It was obvious that these refs had a bias against Yao because of his size. Just because he’s bigger and layups are easier for him, they let defenders get away with murder. A couple of plays later, the same ref called Yao for a three-second violation. It might have been legit. I don’t know. I know for sure he had one foot in the paint, and one foot out of it right before the ref blew the whistle. Not sure if that means he’s still in the paint (I think it does), but it was obvious the ref was watching Yao much more closely than other players. Yao’s disastrous episode with the refs wasn’t over. On the next Houston possession, Yao was called for a moving screen, which was a legitimate call. But obviously it wasn’t Yao’s night. Then two possessions later, the worst call ever came against Yao. He was called for another 3-second violation when clearly he came out of the paint with BOTH feet long before the ref blew the whistle and well within 3 seconds. What the hell is going on here? On the next possession, Barbosa scored to make it 87-73 with 7:20 remaining in the game, and that was about the end of it as the Suns had the momentum they needed to blow the game wide open. I can handle the Rockets losing to the Suns. I can handle Tracy McGrady having an off night and making only 8-of-28 shots for 19 points. Or even Luther Head and Rafer Alston combining for 8-of-27 shooting. But I can’t take Yao being singled out because of his size such that other players know there’s a good chance no foul will get called when they go up to hit Yao on the wrist. The Rockets will have no chance if that continues to happen. All I know is that Ronnie Nunn (Director of NBA Officials) better get his refs in gear on how they call games when Yao is playing, or this sport will become a farce. Coming into Wednesday night’s game against the Rockets, the Phoenix Suns had won 10 games in a row, and 29 of their last 32. We’re all realists here. We knew there was no way the Rockets were going to win. Then compound the fact Tracy McGrady was not going to play because of stiffness in his back — plus the Rockets were on the second night of a back-to-back after losing to Dallas Tuesday night — and you finally had the makings of an old-fashioned blowout loss. But I have to give the Rockets credit. Although they lost 100-91, they put a scare into the Suns. With the odds stack so much against them, the Rockets led by 15 points in the first half (the Suns’ largest deficit in almost two months! ), and still trailed by only 4 points with about 3 minutes remaining. But after coming within striking distance, the absence of Yao and T-Mac was profound. The Rockets missed their last 6 shots down the stretch for the loss. However, with the heart the Rockets are showing, if the Rockets finish in one of the top 5 playoff seeds, I say Jeff Van Gundy may deserve consideration for Coach of the Year honors. This effort was incredible against a team as strong as the Suns. Believe it or not, Rafer Alston was the key to the Rockets’ staying competitive, finishing with a season-high 29 points on 12-of-25 shooting and 8 assists. It looks like Tracy’s back is going to be fine. It’s not related to the back spasms that knocked him out of a few games earlier in the season. He says he’ll play Friday against Denver. For the Houston Chronicle story on the game, click here. You are currently browsing the archives for the vs. Phoenix category.